Orders for books may be placed by phone, letter, or e-mail - contact us. You may send a cheque in £GB, payable as shown under each book. Post and packing costs are given for second class delivery in the UK unless otherwise stated. -Enquire for overseas costs and PAYPAL. 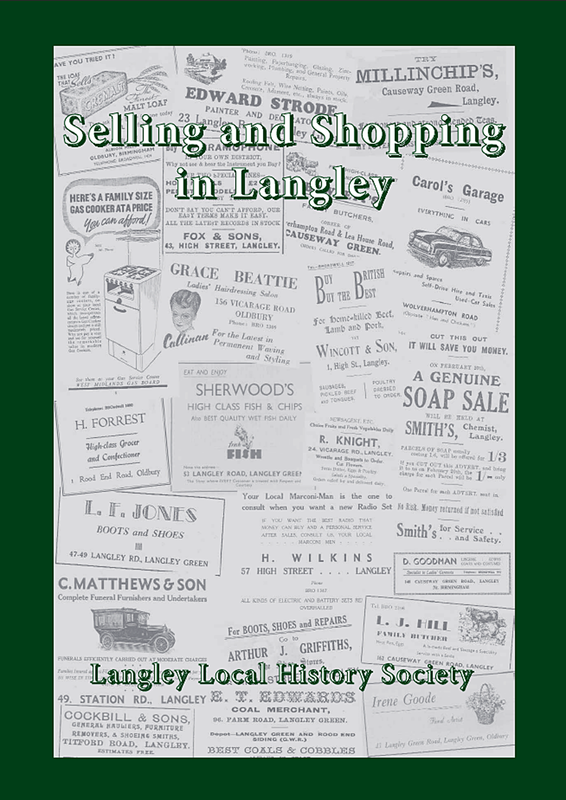 "Selling and Shopping in Langley"
The development of Causeway Green, Langley, Langley Green and Rood End, the expansion of shops and the changes in shopping habits from the mid-nineteenth century to the present day are covered. The are chapters on butchers, fishmongers, greengrocers, grocers, bakers, confectioners, clothiers, shoemakers, builders and household, newsagents and leisure, garages and transport, doctors and medical, and miscellaneous. It includes tables of shopkeepers from the 1880s to 1940 in the main shopping streets, based on trade directories. Fully indexed by trader, subject and place. Over 350 photographs and advertisements. 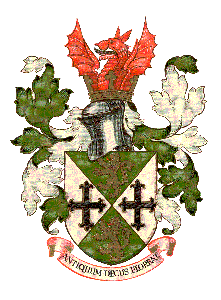 Sterling cheque payable to 'Langley Local History Society'. Fifty photographs taken from postcards sent between 1900 and 1925 are shown, one per page, with a descriptive caption. These give an impression of what Oldbury, Langley and Warley looked like in Edwardian times, WWI and the immediate post-war period. 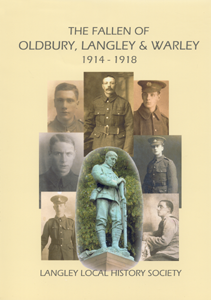 "The Fallen of Oldbury, Langley & Warley 1914 - 1918"
This book is a tribute to the men of Oldbury UDC who died in the First World War. A 40-page colour section covers the battlegrounds where the men died, the mobilisation of forces, the men, their families and memorabilia, and war memorials at home and abroad. This is followed by a roll of honour listing over 550 men with Oldbury connections who gave their lives in the conflict, with personal details of them, biographies and photographs where available. 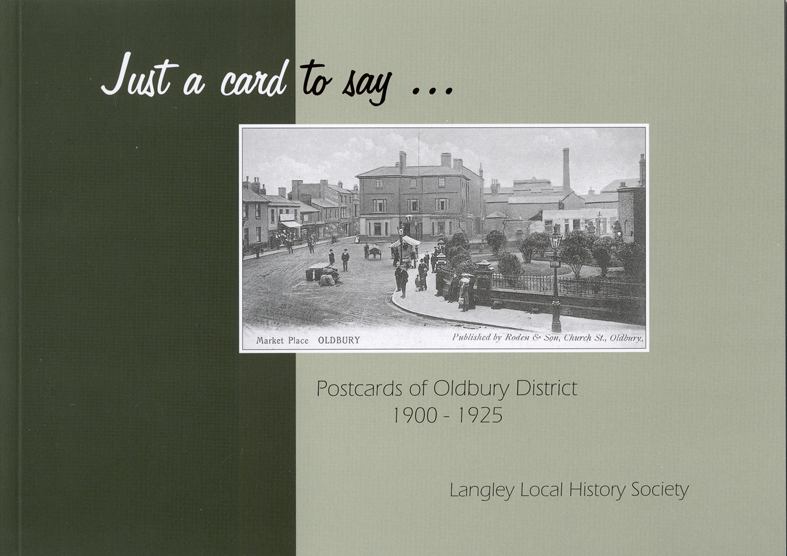 "Playing and Performing in Langley"
Two centuries of pastimes and leisure in Causeway Green, Langley, Langley Green and Rood End covering children's games, family amusements, music making and dancing, cinemas and theatres, clubs, pubs and organisations, sports, parks and holidays, and celebrations.